Fantastic oceanviews from this 2nd floor OCEANFRONT condo. 3 Bedrooms, 2 Baths. If you are searching for the best views, this is the condo of choice - top floor, corner unit offers some of the best oceanfront views! Sleeps 8 Bedding arrangement: 1 King, 1Queen, Double/Single bunkbed with Single trundle. Amenities include fully equipped kitchen, phone, wireless internet service, dishwasher, microwave and washer/dryer, 2 flat panel televisions, DVD player and ceiling fans. Oceanfront swimming pool. 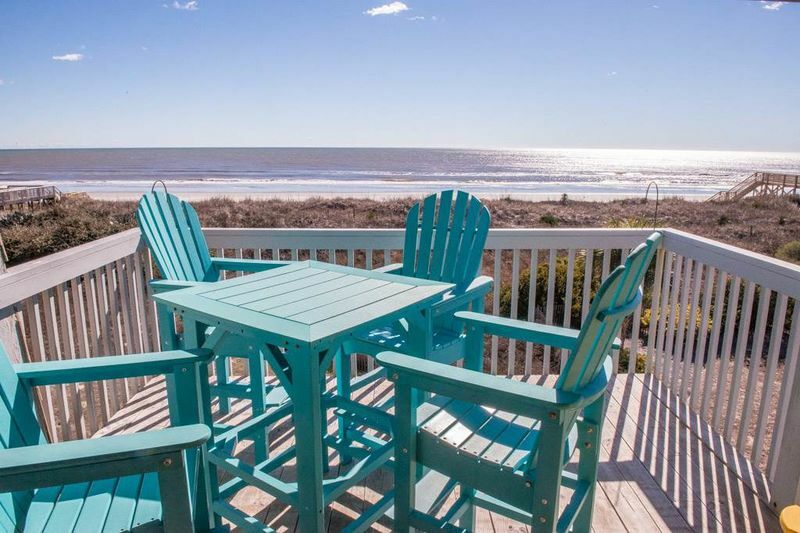 Condo has a private balcony that has a large partially shaded deck with one of the best ocean views on the beach! Read and relax in watch the waves roll in. Non-smoking. No Pets. This was just what the doctor ordered....hmmm!! What an awesome find! We absolutely fell in love with the porch- rain or shine! Gorgeous view. Special touches that made it the perfect getaway for us!! We had a wonderful 2 weeks! This was our second year at your condo and we feel quite at home here! Thanks for opening your condo for our mini vacation! We had a great time! The place is beautiful with an amazing view!